The American Heart Association (AHA) offers several online courses combined with in person skills test to accomplish BLS CPR, ACLS or PALS. The online course is exactly the same as the in person classes, and the same 2 year certification is given. 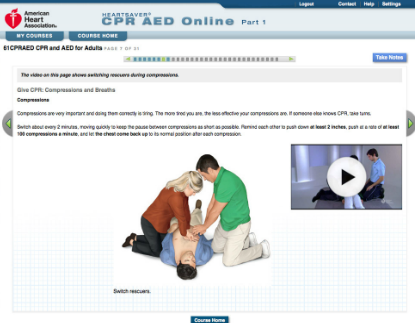 Includes a series of modules (Part 1) that cover all required material in the BLS CPR Healthcare Provider Course. Participants complete the BLS exam online. Those who successfully complete Part 1 receive a certificate, and can take a skills validation test with ShowMeCPR and earn a course completion card. 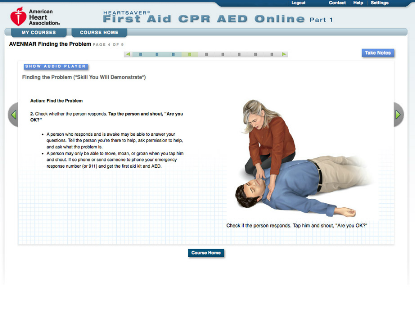 Take the BLS CPR Course on AHA website. 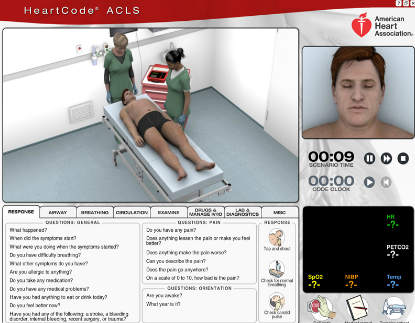 The ACLS Web-based eLearning course provides the cognitive portion (Part 1) of the Advanced Cardiovascular Life Support (ACLS) course, and can be used for initial or renewal certification. Features eSimulation technology to let students participate in realistic patient scenarios, assess patients, and formulate treatment - online and at your own pace. Course participants who successfully complete Part 1 receive a certificate granting them entrance to a skills practice session (Part 2) and skills test (Part 3) with a ShowMeCPR American Heart Association ACLS instructor, which you must pass to qualify for an ACLS course card. The course is PC and Mac compatible. Take the ACLS Course on AHA website. 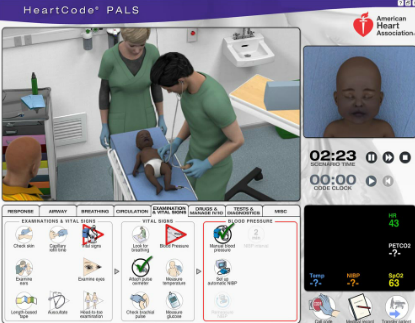 The PALS Web-based eLearning program from the American Heart Association HeartCode Pediatric Advanced Life Support (PALS) delivers training needed to recognize and prevent cardiopulmonary arrest in infants and children. Course participants who successfully complete Part 1 receive a certificate granting them entrance to a skills practice session (Part 2) and skills test (Part 3) with a ShowMeCPR American Heart Association PALS instructor, which you must pass to qualify for an PALS course card. The course is PC and Mac compatible. Take the PALS Course on AHA website. Delivered in three parts,this course covers adult/child CPR with mask, adult/child choking, and adult/child AED, and offers optional modules in infant CPR and choking. Part 1 delivers the cognitive learning through Web-based, self-paced modules that help students gain comfort performing the skills they will need for Parts 2 and 3 - during which they will be required to meet with a ShowMeCPR American Heart Association instructor and complete a hands-on skills practice session and a skills test. Upon successful completion of all three parts, students receive a course completion card valid for two years. Perfect for first-time or renewal training, this course helps employers accommodate diverse learning needs and meets the same objectives as the classroom-based Heartsaver AED course - in only two hours! Take the Heartsaver CPR Course on AHA website. This web-based e-learning product, the Heartsaver First Aid w/ CPR & AED initial or renewal course, provides the cognitive portion of the online course. There are two parts. 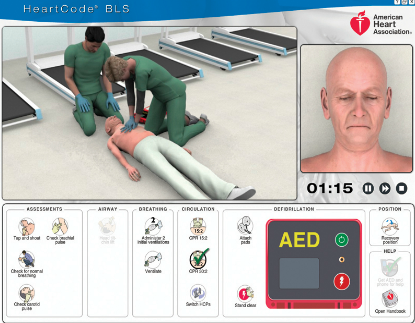 Part 1 includes a series of modules that cover all required sequences for an American Heart Association (AHA) Heartsaver First Aid with CPR & AED course. Participants also need to complete questions. Once part one is successfully accomplished, a certificate is received allowing them to take a skills test with a ShowMeCPR American Heart Association instructor. Part 2 is the hands on skills session with the instructor. When both parts are finished, a course completion card is issued to the student.Take the Heartsaver CPR & First Aid Course on AHA website. Upon successful completion of any of the above online courses you must meet with a ShowMeCPR instructor to complete your skills test. Skills tests take about an hour for BLS & Heartsaver and 3 hours for ACLS and PALS depending on skill level. The online courses are issued the same exact certification from the American Heart Association as the in person classes. Same day certification available. Complete and Pass Part 1 from the American Heart Association at your own pace. Still Unsure? Visit the See the American Heart Associations Online Portal for more info.